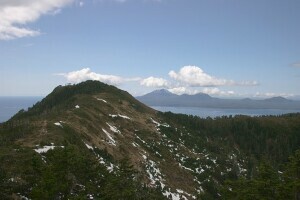 This hike starts near downtown Sitka and ends at the top of Harbor Mountain Road. Hikers typically make arrangements to get picked up on Harbor Mountain or swap keys with someone going the other way. There are wonderful views of Sitka, Mt. Edgecumbe, and the mountains of Baranof Island when visibility is decent. When visibility of exceptional, mainland mountains can be seen over 120 miles away in the north. During the alpine adventure run that is put on each summer, the fastest runners typically finish in around 75 minutes. Most typical hikers may want to take more time than this to enjoy the scenery and avoid cardiac arrest. In winter and early spring snow obscures much of the trail, though it is typically not difficult to figure out the correct route if you have been on the trail previously. There are a large number of wooden steps on the Gavan Hill side. Snow may be many feet deep well into May and June, depending on the previous winter. The first wildflowers bloom in mid to late spring in the alpine where the snow has melted. Wildflowers are abundant along most of the trail. Late fall often brings snow to the higher elevations.